Oct. 31, 2017, 11:31 a.m. Audiences are engaging more with longer videos, and you shouldn’t think of all of the “bounces” that show up in your Google Analytics as bad visits. That’s according to two new studies on video and social traffic out today. Audience tracker Parse.ly and social video builder Wochit both found that content that takes longer to digest is being welcomed by at least some parts of the audience — and Parse.ly noted that there might not be enough supply for the demand. The top 50 percent of visits to webpages tracked by Parse.ly, after excluding visits under 15 seconds, are between 1 and 7 minutes, with 2 percent of those visits greater than 5 minutes. (A visit that lasts past 7 minutes is still rarified air.) 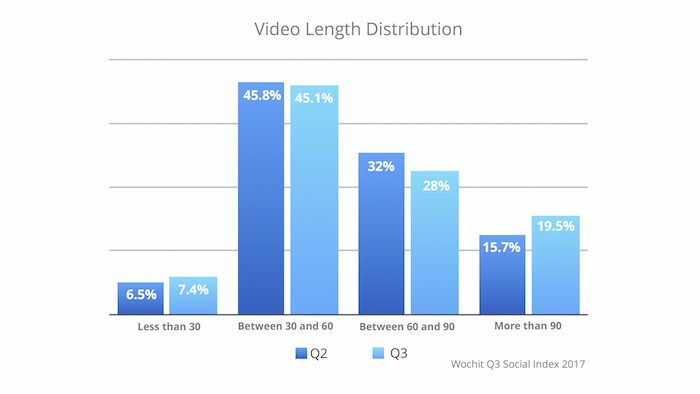 On the video side, Wochit found that videos longer than 90 seconds received nearly 80 percent more shares and views than videos of other lengths, in examining the content of hundreds of publishers on Facebook. Parse.ly looked at 1.6 billion visits to 18 million publisher posts over the first six months of 2017 in an effort to break down the data between bounce rate and engaged time. 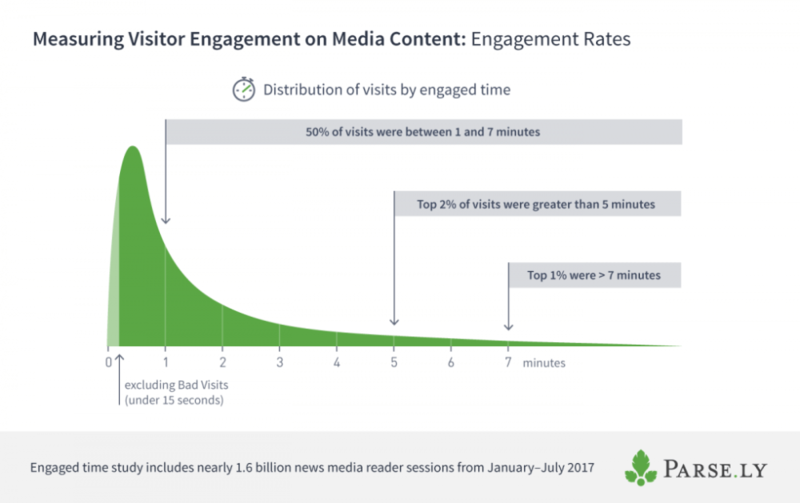 Their data analysts consider “engaged time” to be the initial page click plus the “heartbeat” recorded if the visitor has been active, such as scrolling, swiping, tapping, and more, in 15 second increments. Then they separated engaged time by bad visits or mis-clicks (under 15 seconds), passer-bys (15 to 30 seconds), short-stays (30-60 seconds), and long-stays (more than 60 seconds). The bad visits comprise 32 percent of the visits recorded, but passer-bys (passers-by?) are 23 percent, short-stays are 33 percent, and long-stays are the largest of all at 44 percent. Parse.ly’s analysis didn’t account for the type of content shared on the tracked sites, whereas Wochit’s focused exclusively on Facebook videos. (Wochit creates Facebook-centric videos for publishers including Time Inc., Gannett, and Der Spiegel.) Like its previous report, the third-quarter findings show more video production overall, more Reactions than Likes, better reception of square videos than horizontal, and a continued 1 percent of videos going viral. The company also pointed out that longer videos resulted in sharply increased engagement. Videos over 90 seconds have, on average, higher engagement than those of other durations — even though they account for only 19.5 percent of videos produced in the third quarter of 2017. (That’s 4 percent more than in the second quarter.) Over that span, 45 percent of Wochit-produced videos in the time period were between 30 and 60 seconds. Based on shares and views, Wochit’s top publishers of the quarter were CBS News and Latin American-focused Editorial Televisa, though Gannett, Condé Nash, and iHeartMedia were also contenders. The top three individual videos, by views and shares, included two feel-good stories: “Stranger stops to offer young man ride to work” by CBS News (89 million views and 1,089,000 shares) and “Fort Worth police officers, strangers act of kindness,” also by CBS News (48 million views and 922,000 shares). Schmidt, Christine. 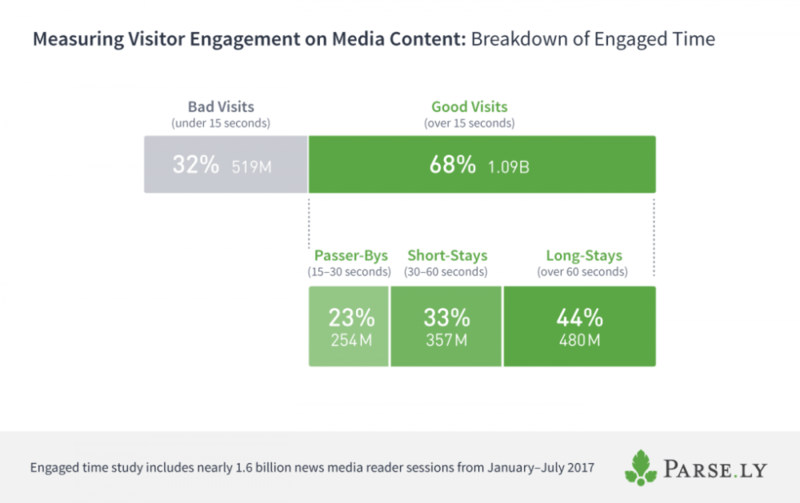 "Longer content isn’t wearing audiences out — and they may even be hungry for more, two studies find." Nieman Journalism Lab. Nieman Foundation for Journalism at Harvard, 31 Oct. 2017. Web. 19 Apr. 2019. Schmidt, Christine. "Longer content isn’t wearing audiences out — and they may even be hungry for more, two studies find." Nieman Journalism Lab. Last modified October 31, 2017. Accessed April 19, 2019. https://www.niemanlab.org/2017/10/longer-content-isnt-wearing-audiences-out-and-they-may-even-be-hungry-for-more-two-studies-find/.